Tallinn is one of many cities where questions of urban development and quality of life are encouraging the growth and increased influence of local neighbourhood associations. The question of how to value the activities of these groups is not a simple one. How might the local expertise and capacity of these active neighbourhoods, to influence urban planning and social cohesion, be integrated into municipal processes? 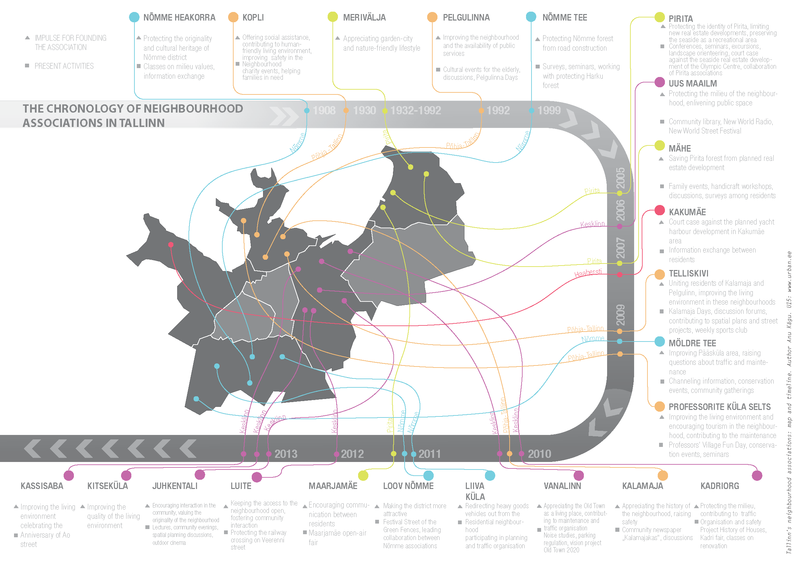 As of January 2014, there are 22 neighbourhood associations in Tallinn. These are groupings of citizens contributing voluntarily to their local living environment and improving neighbourly relations. Around half of the associations have been formed since 2006. There are active neighborhoods in the City Centre, Northern Tallinn, Pirita, Nõmme and Haabersti districts. The associations are formed as non-profit organisations. Membership varies from a few dozen to several hundred. The number of people interested in the associations’ activities often considerably exceeds the number of official members. In terms of nature of activity, the neighbourhood associations can be very different, depending on the environment of the city district and the interests of members. The following list is an example of how neighbourhood associations have had a say in the development of Tallinn in the past 10 years. Protecting public space: the reconstruction of Soo Street in the Kalamaja neighbourhood, the imitative to turn Vana-Kalamaja Street into a pedestrian street, the Uus Maailm vision, the petition of the Pelgulinna Association for protecting the Stroomi forest, the court case started by the Pirita Association to revoke the detailed plan of the Pirita Yachting Centre to preserve Pirita’s seaside as a recreational area. Improving mobility and organisation of transport: the work of the Luite Association for preserving the Veerenni railway crossing, the work of the Möldre Road Association for improving public bus service, the successful work of the Liiva Village Association for directing heavy traffic away from Kalmistu Road. Offering social services: the charity events for underprivileged families organised by the Kopli Association, active inclusion of senior citizens by the Pelgulinna Association. Raising safety and maintenance: the communal work at the Professors‘ Village, communal work at the Juhkental area, the activity of the Old Town Association for curtailing the noise levels of entertainment establishments. Holding cultural events: the Maarjamäe Fair, the Street of Green Gates in Nõmme, the Day of Fun in the Professors’ Village, Uus Maailm annual street festival, Kalamaja Days, Pelgulinna Days. Valuing and redefining district identity: the History of Buildings project in Kadriorg, the activities of the Nõmme Maintenance Association. Participation in the general development of the district, such as discussing the availability of kindergarten and school places or visions for the city’s future and finding possible solutions: the vision conferences of the associations of Pirita, the series of forums run by the Telliskivi Association. In addition the active neighbourhoods contribute a great deal into community relations, local communication (Uus Maailm radio, community newspapers etc) as well as in creating a stronger commitment among the residents of Tallinn to their living environment. In a situation where citizen activism is not highly recognised by the oneparty led Tallinn City Government, there are many misgivings and doubts by the city administration in regard to the representativeness of neighbourhood associations. Typical questions by municipal politicians are: How many members does a neighbourhood association need to justify its participation in the development of the environment of a particular area? When a neighbourhood association is expressing an opinion, does if reflect the feelings of all residents of the area or merely those of a certain group? How is the territory divided if there’s an association of house owners and several housing co-ops also operating in the area? By what right does a neighbourhood association speak out about events in another neighbourhood or city district? Why do neighbourhood associations want to create a parallel structure next to the city district governments? The workshops held in 2013 by the neighbourhood associations’ collaboration initiative called Urban Idea (Linnaidee) have tried to answer these questions and in defining the neighbourhood association, several conclusions have been made: 1) a neighbourhood association is not a representative assembly of the residents of the area, it is a (ideally one of many) citizens’ association that focuses on improving the local living environment; 2) a neighbourhood association does not have to represent all residents of the area because that would contradict one of the founding principles of the associations (and democracy) – fostering diversity. There are several neighbourhood associations and other organisations in one area and when there are disagreements, making a decision to address diverse interests lies with the city government; 3) although the term ‘neighbourhood association‘ (in Estonian asumiselts) has become a fixture in public vocabulary, most of the neighbourhood association do not operate within the historical borders of districts set by the city, but instead determine their territory of activity themselves (a good example of that is the Telliskivi Association that cares for the well-being of the Pelgulinn and Kalamaja neighbourhoods). At the same time, local life is influenced by decisions that are made outside that particular area or affect the entire city, such as public transport, schools and kindergartens, and organisation of transport, which is why the neighbourhood associations bring a local perspective to these discussions and make suggestions for improving city-wide systems; 4) as the neighbourhood associations bring together people with very different interests, the decision-making tries to follow the principles of deliberative democracy, which means looking for a consensus or if that fails, to cater to different opinions in the best possible way; 5) a neighbourhood association does not wish to create a parallel governing structure, instead, it is willing to be a mediator between the neighbourhood and the city authorities, passing on information on the neighbourhood’s needs and problems, that is to say, it strives for being an expert of local living conditions. There’s still a great deal to be done in terms of inner democracy among the neighbourhood associations, and it is logical that the pace of the process follows the development of the society and the self-awareness of citizens. The larger the footing of a neighbourhood association in the local area and further, the more frequent and substantial the communication with the authorities, the more contacts there are with the representatives of other active neighbourhoods, the greater is the need for writing plans of action for non-profit organisations, competent public relations, supervising volunteers and obtaining finances. The greater the resonance and field of influence of the neighbourhood association, the greater the responsibility of the board of the association to ensure transparency and improve co-operation. As is the case with the lifespan of any non-profit organization, the established neighbourhood associations will also eventually need operating subsidies. So far, no neighbourhood association of Tallinn has secured a fixed subsidy from the city or any civic society fund, although it has been discussed in several neighbourhood associations. In addition to protecting public interests, the neighbourhood associations could also include other parties in the improvement of the living environment (the following are suggestions from the neighbourhood associations’ workshops): the neighbourhood association could be a partner for real estate developers in creating visions for the future appearance of the neighbourhood to prevent possible future disagreements; the neighbourhood association could exchange information with housing co-ops and communities and pass on contacts of local entrepreneurs; the neighbourhood association could offer local businesses an additional outlet for advertising (the local paper, website, etc), additional earning opportunities at community events and help with shaping positions related to the business area. Some of these points on development certainly apply also to the neighbourhood associations active in other Estonian towns: Tartu, Pärnu, Paide, and Rakvere.